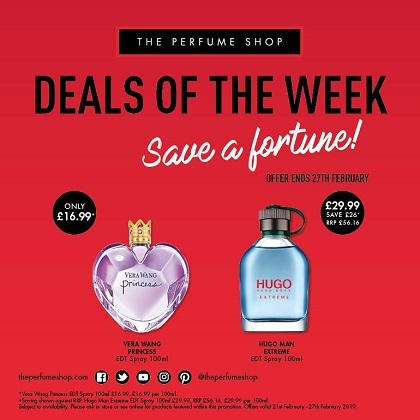 Get the latest Deals of The Week at The Perfume Shop or you’ll regret it. Until 27 February you can scoop up sensational scents and pay a lot less than you would anywhere else, including Duty Free. Vera Wang Princess EDT Spray 100ml is at the special price of £16.99 and Hugo Man Extreme EDT Spray 100ml is £29.99 down from £56.00, saving you £26.00.